The diamond is a precious stone that lots of people would love to own. 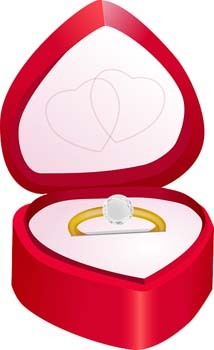 In fact, the first diamond every given in an engagement ring was way back in 1477. Archduke Maximilian of Austria gave his true love (Mary of Burgundy) a gold ring with the letter "M" in diamonds. That is cool, but did you know Diamond actually starts out as carbon? Or the only thing that can scratch diamond is another diamond? Let's explore the world of Diamond to see what other sparkling facts we can uncover. Diamonds are thought to date as far back as three billion-years, or more! For thousands of decades this substance has been highly prized. Diamonds were collected and traded in India as early as the 4th century B.C. In fact, in the 1400's, India was the only known source of diamonds. This lasted until the 1700's, then Brazil took over as the main source for this precious stone. In the 1800's a huge diamond source was located in South Africa. Today, diamonds are being mined all over the world. Where on Earth is Diamond Found? Diamonds are found deep inside the earth; from 90 to 120 miles down (144 to 193 kilometers). This gem is produced when carbon is compressed tightly together then heated to extreme temperatures (2,000 to 3,000 degrees Fahrenheit or 1,093 to 1,648 Celsius). Sometimes diamonds will find their way to Earth's surface through volcanic eruptions, but mostly people have to dig or mine for them. The Ancient people of Rome and Greek believed diamonds were the tears from the gods. Some even thought diamonds were broken pieces from the stars. Ancient Hindus placed a diamond in the "eye" of their statues and believed it would protect them from danger. 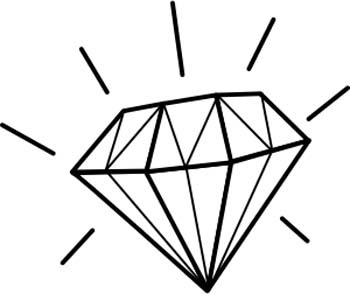 The Middle Ages had some folks believing a diamond could cure disease. Some Ancient cultures thought a diamond worn on battle armor would give them strength and courage. What is Diamond Really Used For? Although myths are fun to read about, the diamond really is a useful gem. Since this stone is the hardest substance on Earth, it is used in cutting and grinding tools. It can also polish and wear away other substances. However, perhaps the most popular use of this sparkling gem is in jewelry. When diamonds were first discovered, miners rushed to find as many as possible. But this requires them to remove large amounts of soil. This can damage the land, reroute rivers and lead to deforestation. Mining can be very harmful to fish and wildlife and even people. In addition, in the quest for finding diamond, miners dig pits. Over time these abandoned pits will fill with water. This in turn becomes a breeding ground for harmful insects, like mosquitoes that can spread malaria and other diseases. Today, the mining of diamonds has been regulated in order to keep these harmful things from occurring. labs can now recreate diamonds that look and feel identical to real diamonds? the largest diamond ever found is called the Cullinan diamond? It weighs a whopping 1.33 pounds (0.6 kilograms) which is 3,106 carats. the word "Diamond" is derived from the Greek language; adamas, meaning indestructible? Diamond is the birthstone for people born in April? less than 20 percent of all diamonds found are good enough to be made into jewelry? blue and red colored diamonds are extremely rare? to burn a diamond you would have to heat it to a temperature of around 1,292 degrees Fahrenheit (700 degrees Celsius)? Look Up in the Sky! It's the Sun. It's the Moon. It's...a Space Diamond? There is a diamond in outer space that is the size of our moon! Lucy or BPM 37093 was once as bright as our sun, but has now shrunk. And because of all this compressing and extreme heat, the core of this star has turned into a huge diamond. It is (hold onto your seat) 4,000 kilometers in diameter (2,485 miles) which makes it 10 billion trillion trillion carats. Phew! That's one big gem. Now that you have learned all about Diamond and how important it is, go out and impress your friends and family with these fun facts. They may think you are a brilliant "gem-ious" with all these fascinating factoids.